"I need bracelets for karate." My son sat in the backseat as we headed home last Monday. "What?" I was confused. "Why do you need bracelets for karate? What kind of bracelets? What are they for?" Zane had no answers for me. He's a boy, and traditionally, boys are not interested in things that are extremely important to their mothers. I consulted the authority in such matters. The backpacks of children have become vital in parent-teacher communication, and I hoped that some note could be found to illuminate this mystery. This time, however, I came up short. There was only a note about appropriate dress for the Kindergarten Mardi Gras parade for March 4th. Every day this week, my son has told me that he needed bracelets for karate, and every day I have been completely clueless. Until yesterday, when the lightning bolt of comprehension hit me. If a person, say a teacher, were saying the words 'Mardi Gras' very fast, it might sound syllabically similar to the word 'karate' to a six year old boy with attentional issues. Mystery solved. We headed to the dollar store, where the boy got his 'bling' on. The Mardi Gras parade will be a hit this year, at least for this kid. haha love it, karate and mardi gras isn't necessarily a common mishear but for a 6 year old it works. 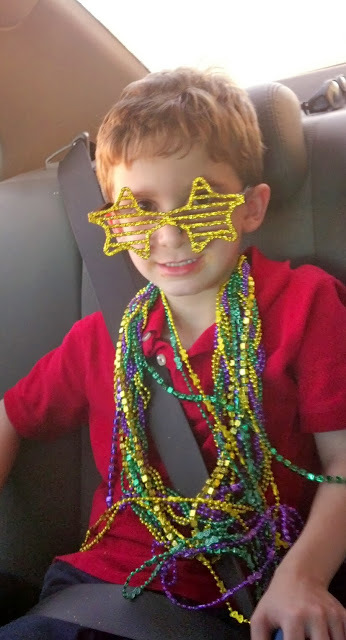 Looks like he's all set for his mardi gras party - thanks for sharing! priceless=righteous...either way I LOVED this one! You busted out the finest momciphering skills! Brackets for karate sounds like so much more fun. Laughing and impressed with decoding skills.